Back in 1994, the last time Democrats had majorities in the House and Senate, the broadcast networks tried to suffocate the Republican challenge with negative spin. NBC Nightly News anchor Tom Brokaw scoffed at the GOP's Contract with America: "It is long on promises, but short on sound premises." No Republican got worse press that year than the man who would be Speaker, Newt Gingrich. ABC's Jim Wooten slammed Gingrich as "the national poster boy for the politics of resentment and rage." CBS's Eric Engberg skewered Gingrich as "bombastic and ruthless....the family values candidate who divorced his ailing first wife." ■ Labels. The last time an evening news reporter called Pelosi a "liberal" was November 14, 2002, the day she was elected House Democratic leader. "She is a high-octane San Francisco liberal with a fondness for high-fashion Armani suits," NBC's Lisa Myers explained that night. Since then, evening news reporters have omitted any ideological labels for Pelosi, who in the past five years has earned a 99% approval rating from the liberal Americans for Democratic Action, compared to a mere 3% approval from the American Conservative Union. ■ Spin. Since 2002, Pelosi herself has been the subject of just 16 evening news stories, eight of which were flattering vs. two that cast her in a negative light, a four-to-one tilt in Pelosi's favor. (The remaining six stories were neutral.) In November 2002, ABC's Linda Douglass touted Pelosi as someone who "rose to a leadership job with sheer hard work, raising money for colleagues, spending hours listening to their problems, providing them dinner during late night votes." A month later, ABC's World News Tonight picked Pelosi as one of five heroes of 2002. Anchor Charles Gibson said ABC wanted to recognize "people whose bravery, resolve, and character really shown through." ■ Attack Soundbites. 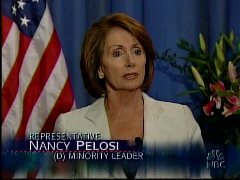 Most of the time, the evening newscasts gave Pelosi a podium from which she could attack Republicans. 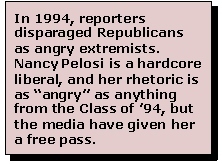 Sixty-three stories included anti-GOP soundbites from Pelosi; in another 10, the network reporters simply read Pelosi's attack quotes to viewers. On May 20, 2004, CBS showed Pelosi bashing President Bush: "The emperor has no clothes. When are people going to face reality?" On December 6, 2005, NBC ran a bite from Pelosi casting all Republicans as crooks: "Republicans believe that they're above the law. Their hubris, their arrogance is something that the American people are paying a price for." None of these quotes were termed "harsh," "angry" or "mean." Just two stories showed Pelosi dealing with Democratic embarrassments, including a June 8, 2005 ABC piece on Howard Dean's gaffes (calling the GOP a "white Christian party" and saying "a lot" of Republicans "have never made an honest living"). Pelosi's spin: "I don't think that the statement that the governor made was a helpful statement. But I do think that he's doing a great job of broadening the base of those who are involved in the Democratic Party."